Tweet In my last post, I didn't really want to do a comparison shot between my pregnancies with Klaw & Scream. I changed my mind. I'm just over 24 weeks pregnant with Scream and I decided to just go for it. I think it's neat to compare the two pregnancies. I'm a little bigger this time around, but I feel like my body & belly is shaped almost exactly the same with the two boys. Thankfully, everything is going well. I'm still pukey, but I have accepted that this is just how I do pregnancy. 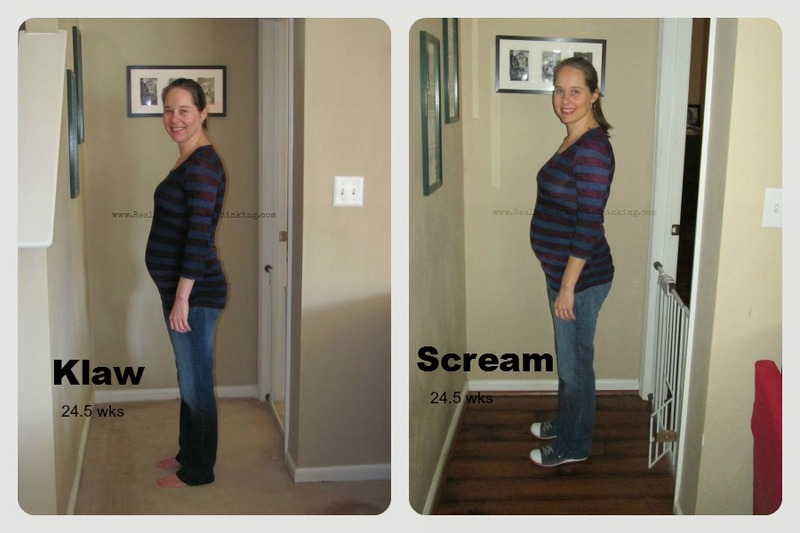 Scream seems healthy and is very active in the womb. Very. Active. I've been reading some new (to me) pregnancy & birthing books. I tend to be interested in the books discussing the socio-economic/cultural aspects of the American birthing system and books that affirm our bodies' abilities to give birth without intervention, barring emergencies. On the one hand, it's absolutely amazing how much we are able to do with modern medicine. So many lives, both babies & mothers, can be saved now that would have been lost decades ago. On the flipside, it seems so counter-intuitive to prescribe these amazing life-saving interventions to women who are capable of having a medically uneventful birth. No, I'm not getting into a debate over which model (midwifery or medical) is better. I have my opinions about what appeals most to me but I won't begrudge another woman the decisions she makes or the healthcare provider she trusts & is most comfortable with leading up to & during birth. Personally, I like to keep my feet in both worlds by birthing in a hospital with both a midwife & a doula. That way, someone else has to clean up the mess and my dogs aren't all up in my business. Balance. What is some of the best advice you have heard regarding pregnancy &/or childbirth?